3…2…1 – You’re on the Air! Ever listened to a podcast or a radio interview and wondered, what it’s like to be a guest? Is it scary or fun? Is it live or recorded? What’s the proper attire for the occasion? Etiquette? And so on. Since I’ve had the pleasure of doing such things to promote my books for about fifteen years now, I’d like to share a behind-the-scenes peek at how these interviews work, and how YOU can prepare for them when you are invited to speak with a radio or podcast host about your newly-published book. The first tip is to relax! Flip your thoughts sideways to the FUN setting. Your host wants you to succeed. The listeners want to be entertained. Your host is a professional with years of experience and will guide you securely through a series of questions that line up nicely with your book promotion goals. 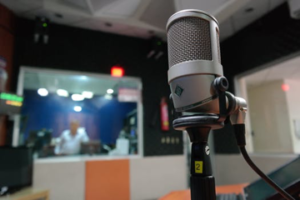 In advance of your interview, it’s a great idea to access previous interviews this radio show or podcast host has done so you can listen to his or her sense of interview style, speech rhythms, types of questions, etc. Before you dial in for your on-the-air moment, brainstorm just what those questions might be. Write down your answers in advance. Think about what information listeners might need to find you and your book after the interview is done: your author website, the publisher’s website, the exact title of your book, how much it costs, whether it’s paperback or hardcover, where online and in store it might be found, etc. Print out these Q&A possibilities and key points in large type, and have that in front of you when your interview time comes along. Before you call in to the radio station or podcast studio, have the following within easy reach and sight: your book; your bio; your brainstormed Q&A list; a bottle or glass of water; eyeglasses if needed; and your computer screen with your author website open and the sound turned off. Also keep the name and telephone number of your interviewer handy in case something happens (phone dies, cell signal drops) and you need to call right back. Speaking of sounds, make sure that you are on a secure telephone line that will not fade in and out; distort sound; or drop your call altogether. I like to use a landline. If possible, it’s best to be in a quiet room, with the doors shut. If you know that the landscaping company comes at 3 p.m. on Mondays, don’t schedule a radio or podcast interview for that time. If you work from home and have pets, make sure they are somewhere safe and happy. No barking or meowing accent notes, please! It’s good manners to call in a few minutes before your interview is set to either be recorded or go live. Your host will be happy to know that you are there, in the queue, ready to be ‘on’ when needed. You will have time to take a deep breath, make sure your resource materials are at hand, and begin to smile. Yes, I said smile. Your listeners can’t see you smile, but they sure can hear it in your voice. Once the interview has started, keep in mind when responding to the interviewer’s questions that it’s important to finish your thought and then pause, so he or she knows to ask the next question. Otherwise, both of you might be talking at the same time, making it difficult for listeners to understand what’s being said. What’s acceptable attire for a telephone interview with a radio show or podcast? You can wear anything of course, as long as it’s comfortable, be that pajamas or your favorite jeans. One last tip: go to the bathroom before you call in. It’s hard to concentrate on two things at a time. And you’ll want to have all your focus on promoting that beautiful new book of yours. If you have any other ideas on how to best prepare for and perform on radio and podcast interviews, please leave them in the comment section below. We’d all love to learn from your experience! MAY YOUR WISHES FOR NEW VISION AND INSPIRATION COME TRUE!